"I found many of your questions to be similar in nature and difficulty to those on the actual exam. My overall score on the pre-test paralleled that on the actual exam. 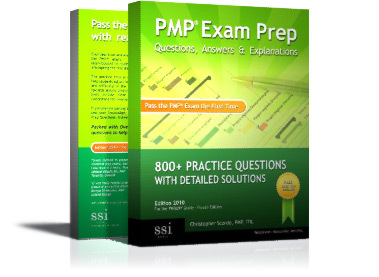 Passing these practice tests prior to sitting the PMI exam allowed me to take it with confidence. I found that taking the practice tests also sped up my answers and I completed the PMI exam with time to spare." "Just a quick note to let you know that using TrainAgile was a major part in my successful completion of obtaining my PMI-ACP. I think the most important part of this was not so much the actual answers, but more of learning what the questions were really asking. It made me think like the PMI. This helped my understanding immensely. " "I Passed. Of all sample exams - Crowe, Crosswinds and TrainAgile - TrainAgile was the closest to the test I received. " "I passed my PMI-ACP today!!!! Halleluah!! The PMI-ACP does not give a score when it is passed. The notification simply says pass or fail on the sheet provided at the testing center. So I did have to makeup a passing score and send it in to your website. BUT I DID PASS. I had read and studied two additional study guides but nothing helped me as much as TrainAgile. Thank you for making such a quality site. I will definitely recommend you to others. Take care and thanks again." "Thank you so much for creating TrainAgile. I passed the PMI-ACP exam on my first try. I plan to retake the practice tests until my subscription expires to reinforce my weak areas. A very satisfied customer." "I would like to share that I just passed the PMI-ACP exam this week. TrainAgile tests were very helpful and made me feel more confident when taking the actual exam. Thank you." 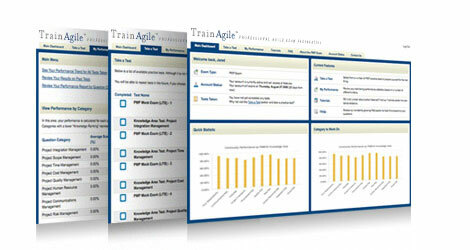 "I used TrainAgile to assist me in my preparation of the PMI exam, which I passed on the first try! The test results tracking allowed me to focus my extra studying time on the knowledge areas I scored the lowest on. I have recommended TrainAgile to my co-workers." "I signed up for TrainAgile about 3 weeks before I was scheduled to take the PMI-ACP exam. It was a great way to test myself against everything I’d learned in preparation for the exam. I was determined to take and pass the exam on my first try; therefore, I thoroughly appreciated the feedback that allowed me to quickly pinpoint and focus on process groups that required additional study. I passed the PMI-ACP exam on November 17th and I believe TrainAgile provided the drill down support required for me to be successful on my first try. Thank you." "TrainAgile was a perfect supplement to my preparation for the PMI-ACP exam. I was given insight into the types of questions I'd see on the exam and into the areas I was weak. All in all, I have and would continue to recommend TrainAgile as a supplement for PMI-ACP exam preparation." "In a nutshell your tests helped significantly in my endeavor to obtiain PMI-ACP certification. The way tests are grouped and summary tests kept me interested. Difficulty and content is similar with real exam although just a bit on the easy side. They have covered well all PMBOK and most importantly you can rely on the answer explanations as being clear and trustworthy. Keep doing the good work!" "I wanted to let you know that I passed the test today. So you have another PMI-ACP to add to your alumni list." "Thank you so much for teaching this PMI-ACP class. I passed the PMI-ACP exam last week, thanks to you and Tony's great material. All your tips and tricks helped me a lot for the examination. Thanks for the constant support and encouragement. Thank you to you and your wonderful team. Couldn't have done without you all." "I took the PMI-ACP exam last Saturday at the Bedford center and I passed the test! I am so relieved that it's over. The exam was really hard for me. Thank you for the class! I'll be recommending this to all my co-workers who are planning to get their PMI-ACP certification." "I was in your class this week. I passed the test today! I’m glad it’s over and I can be an evangelist for this class. In my particular instance, you took me from 0 to passing in 4 days. I conclusively passed every section of the exam, although by the end I was not convinced of my success. Anyway – thank you and you shall hear from more people (at our company) in months to come!" "There are a lot of exclamation points today. Thank you for teaching your PMI-ACP class! I appreciate your teaching style and love of subject matter! Speaking of success... Today, I PASSED the PMI-ACP Exam and excitement abounds! Many blessings to you and the team! Have a great week! Sincerely,"
"Whenever I come across something that had a positive impact on my success, I let people know about it. Thank you for offering TrainAgile, I am sure to recommend it to others." Learn more about the SSI Logic exam preparation philosophy, or visit the SSI Logic website for a complete list of all exam prep tools. 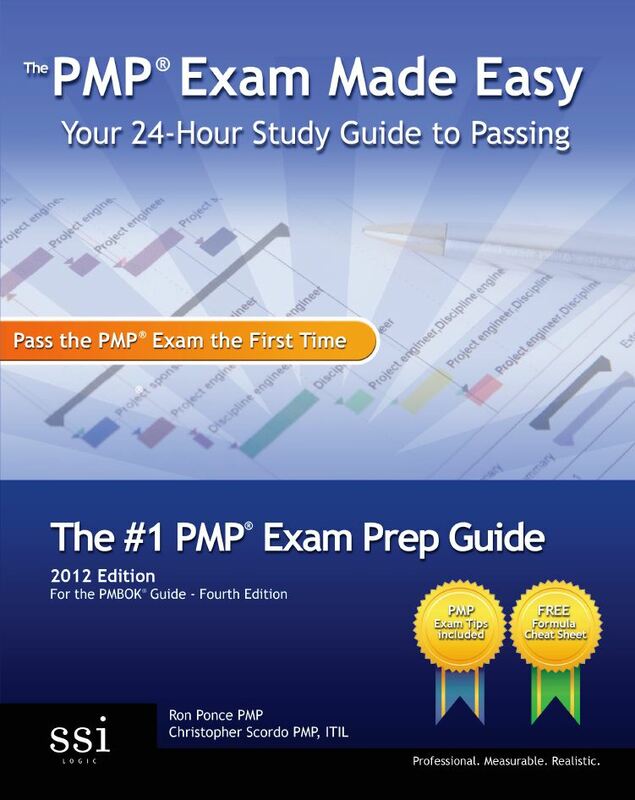 Everyone knows that the PMP® Exam is legendary for its difficulty. But it doesn't have to be so intimidating. With expert tips for exam success, The PMP Exam Made Easy makes acing this challenging exam easier than ever. Our comprehensive study guide gives you all the tools you need to succeed on the PMP Exam - the first time. Based on the PMBOK Guide - Fifth Edition (2013), the practice tests in our PMP exam prep book are designed to help students adjust to the pace, subject matter, and difficulty of the real PMP exam. Geared towards anyone preparing for the exam, all PMP practice tests include clear solutions to help you understand core concepts. 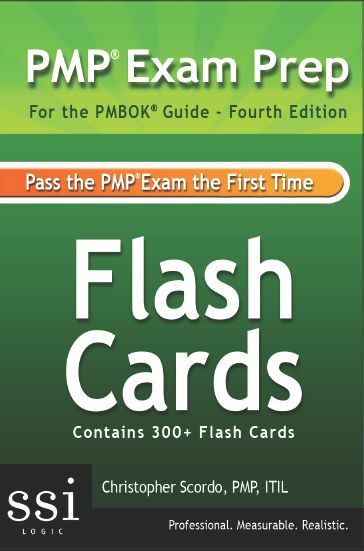 These PMP Flash Cards are a perfect companion for those studying for the PMP exam. PMP flash cards by SSI Logic reinforce critical PMBOK terminology, PMP exam concepts, and definitions which you will see on the PMP exam itself. Based on the official ITIL Foundation syllabus and the ITIL core volumes, the practice exams in this book are designed to help students adjust to the pace, subject matter, and difficulty of the real ITIL Foundation exam. Geared towards anyone preparing for the exam, all tests include clear solutions to help you understand the core concepts. 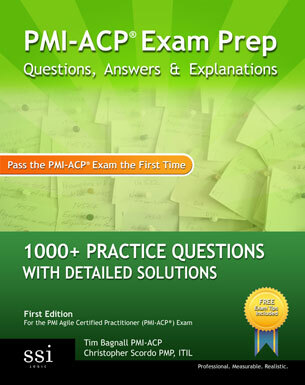 Based on the latest PMI-ACP® exam outline, the practice tests in this book are designed to help students adjust to the pace, subject matter, and difficulty of the real PMI Agile Certified Practitioner (PMI-ACP) exam. Geared towards anyone preparing for the exam, all tests include clear solutions to help you understand core concepts. Based on the CISSP Common Body of Knowledge (CBK) Domains, the practice tests in our CISSP exam prep book are designed to help students adjust to the pace, subject matter, and difficulty of the real CISSP exam. Geared towards anyone preparing for the exam, all CISSP practice tests include clear solutions to help you understand core concepts. PMTraining® offers a suite of PMP exam preparation tools, eLearning courseware, and live courses for users taking the Project Management Professional (PMP) certification exam. TrainAgile offers a range of Agile exam preparation courseware and training options has a primary focus on preparing students for the PMI-ACP certification, as well as other Agile certifications. 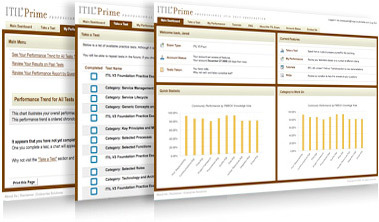 ITIL Prime® offers a range of ITIL exam preparation courseware and exam-taking options; and is the only officially licensed and endorsed ITIL Foundation preparation software tool available. 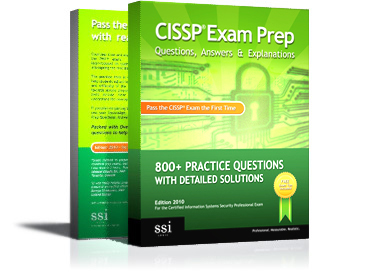 CISSPExamPractice® offers a collection of CISSP exam preparation tools for users taking the Certified Information Systems Security Professional (CISSP) certification exam. 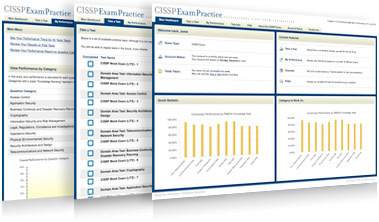 CISSPExamPractice.com analyzes student aptitude in each CISSP domain area following the completion of realistic CISSP mock exams and practice quizzes. Use Wellhire to reduce the time and cost of your hiring process through simple tools which attract, assess and qualify job candidates. 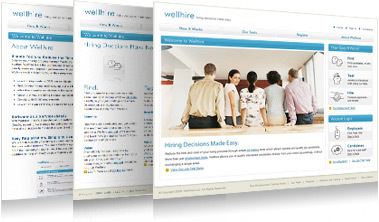 More than just applicant tracking, Wellhire allows you to qualify interested candidates directly from your online job postings- without exchanging a single email. Based on the PMBOK Guide - Fifth Edition (2009), our PMP exam prep app is designed to help students learn on the go with realistic PMP exam questions, progress-saving features, and easily accessible answer keys and explanations. 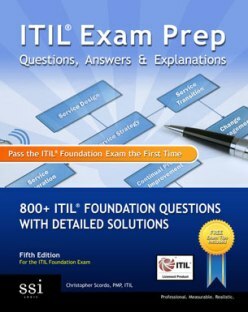 Based on the official ITIL V3 Foundation syllabus and the ITIL V3 core volumes, our ITIL exam prep app is designed to help students learn on the go with realistic ITIL Foundation exam questions, progress-saving features, and easily accessible answer keys and explanations. 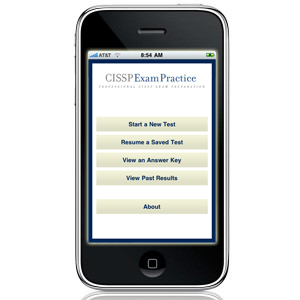 Based on the CISSP Common Body of Knowledge (CBK) Domains, our CISSP exam prep app is designed to help students learn on the go with realistic CISSP exam questions, progress-saving features, and easily accessible answer keys and explanations. Visit the SSI Logic website for a complete list of all exam prep tools.